Known for great color and performance, Fujifilm has also carved out a niche for itself by consistently providing good-quality consumer digicams at rock-bottom prices. The latest in their line of bargain-priced cameras is the Fujifilm FinePix A350, a 5.2-megapixel digital camera, and its twin the FinePix A345, sporting 4.1 megapixels. The Fuji A350 carries on the value-leading tradition of Fujifilm digital cameras by offering a 5.2-megapixel CCD and 3x optical zoom lens at a low price, including a good-sized bright LCD monitor, Pict-Bridge support, two-second maximum exposure time and four preset scene modes. As you'd expect, the Fujifilm FinePix A350 trades off a few features and capabilities to achieve its remarkably low cost, but the camera still takes good-looking pictures in daylight conditions, and is simple enough for even rank beginners to enjoy immediately. The Fuji FinePix 350 and its $249.95 4.1-Mp twin the FinePix 345 share not only a trim, rectangular body style in a sleek metal finish but the manual as well. The latest models in the "A-Series" line, their retractable 3x zoom lenses include an automatic lens cover, dispensing with the sliding cover of previous models. At 3.5 x 2.4 x 1.2 inches (90 x 60 x 30.3 millimeters), the new models are smaller and more compact than their predecessors, easily slipping into a shirt pocket, a purse (nearly a coin purse) or small leather pouches. They're only a little taller than a credit card, if quite a bit thicker. Both new models also enjoy a boost in image quality and overall performance. To process data from the FinePix A345's 4.1-Mp CCD and the FinePix A350's 5.2-Mp CCD, both cameras use new image processors that produce more robust color and enable quicker frame-to-frame shooting. Also new on these models are larger, 2.5-inch LCD monitors. And Movie mode now can capture sound, too. The Fuji A350 shares the operational simplicity of past models, with fully automatic exposure complemented by a "Manual" mode that lets you set exposure compensation and white balance. In addition, four Scene modes are available to shoot Portrait, Landscape, Sports and Night images. In full Auto mode, the camera handles everything including flash, unless it's suppressed. Manual mode lets you adjust exposure using exposure settings from -2.1 to +1.5 EV in 0.3 EV steps. It also lets you select one of seven manual White Balance settings, including Outdoors (good weather), Shade, Daylight Fluorescent, Warm White Fluorescent, Cool White Fluorescent or Incandescent. When the flash is active, the white balance setting for flash is used, regardless of the White Balance mode setting. Suppressing the flash enables the White Balance mode setting. The Fuji A350's four Scene modes optimize camera settings for specific situations. Portrait enhances skin tones and sets a soft overall tone. Landscape sets the camera for shooting scenery in daylight with no flash. Sports gives priority to faster shutter speeds for capturing sporting events and Night does just the opposite, favoring slower shutter speeds up to a full two seconds for shooting evening and night scenes. A tripod is recommended for Night Scene mode. None of the Scene modes allow you to adjust Exposure Compensation or White Balance. The new retractable Fujinon 3x optical lens ranges from 5.8-17.4mm (a 35-105mm 35mm equivalent), a moderate wide angle through a useful telephoto typical of point-and-shoot digicams. Maximum aperture ranges from f/2.8 to f/4.7, depending on the zoom position, and focuses in Normal mode from two feet (60 centimeters) to infinity. In Macro mode, the lens focuses from 2.4 inches to 2.6 feet (6 to 80 centimeters) but restricts the focal length to the wide angle setting. In addition to the 3x optical zoom, the FinePix A350 also offers as much as 4.1x digital zoom, which effectively increases the camera's zoom range to a total of 12.2x. Keep in mind though, that digital zoom decreases the overall image quality, since it just stretches the center pixels of the CCD image. For composing images, the Fuji A350 offers both a real-image optical viewfinder as well as a generous and bright 2.5-inch color LCD monitor. The optical viewfinder sees only about 75% of the captured scene. The LCD monitor reports some camera settings (but not shutter speed or aperture), and can overlay an aligment grid. The grid divides the image area into thirds, both horizontally and vertically, making it easier to line up tricky subjects. The through-the-lens auto focus system uses contrast-detection to find the subject. Sensitivity ranges automatically from the equivalent of ISO 64 to 400. The built-in flash is effective from 2.0 to 11.5 feet (0.6 to 3.5 meters), reaching 9.8 feet (3 meters) in telephoto and 2.6 feet (0.8 meters) in Macro mode. Flash modes include Auto, Red-Eye Reduction, Forced Flash, Suppressed Flash, Slow Synchro and Red-Eye Reduction with Slow Synchro. Slow Synchro leaves the shutter open a bit longer than normal to capture more of the ambient light, leaving the main exposure up to the flash itself. Image quality settings include two 5-Mp settings for 2592x1944-pixel images, Fine and Normal; 3:2 (the standard 35mm aspect ratio) at 2592x1728; a 3-Mp setting for 2048x1536; a 2-Mp setting for 1600x1200; and a 640x480 VGA setting. Except for the 3:2 setting, image are captured with a 4:3 aspect ratio. The Fuji A350's continuous Shooting mode captures images continuously if there is room on your memory card when you hold down the shutter button at the rate of 1.4 frames per second. The number of frames depends on the image quality setting. Five frames can be captured at 5-MP Fine, and at 5-Mp Normal, eight. At 3:2, nine images at a time; at 3-Mp, you can capture 13; at 2-Mp, 15; and at VGA quality, 69. Focus is set for the first frame and does not change through the sequence. The flash is suppressed, too. Self-Timer mode offers a 2 or 10 second delay between the time the Shutter button is pressed and when the shutter actually opens, so you can get into your own shots. The Fujifilm FinePix A350's movie mode captures MPEGs with monaural sound at 15 frames per second in either 320x240- or 160x120-pixel frames. Zoom is disabled during recording. Recording stops and starts with a brief, full press of the Shutter button. As you record, the duration of the movie appears in a running counter on the LCD monitor. Maximum movie lengths depend on the size of and free space on your card. The included 16-MB card holds 65 seconds at the 320 setting, but a 512-MB card would capture 34.6 minutes. The Fujifilm FinePix A350 features Pict-Bridge support, which means you can connect it via the included USB cable to a Pict-Bridge printer and use the A350's Digital Print Order Format features to select images to print directly from the camera. Options include quantity per image (up to 99) and whether or not to imprint the date on the image. In addition, when the camera captures images, it records Exif Print Format data containing a variety of shooting information for optimal printing. The Fuji FinePix A350 ships with a 16-MB xD-Picture Card. The xD-Picture Card itself is very tiny, rivaling the popular SD memory cards in size. I highly recommend picking up at least a 128-MB card right away, given the camera's 2592x1944-pixel maximum resolution size, though a 512-MB card is also available. The Fuji A350 uses two AA-type batteries for power, either alkaline or NiMH, and an optional AC adapter is available. A set of single-use AA alkaline batteries comes with the camera, but I strongly recommend purchasing a couple of sets of high-capacity NiMH batteries and a good charger, and keeping a spare set of batteries charged at all times. See my "NiMH Battery Shootout" report to see which batteries currently on the market are best, and read my review of the Maha C-204W NiMH battery charger, my current favorite. Images can be transferred from the Fujifilm FinePix A350 via the included USB cable. The optional USB pen drive accepts an xD-Picture Card, making an attractive alternative. A video cable for viewing images on a television set is also included as is a software CD with Macintosh and Windows versions of the capable FinePix Viewer. 5.2-megapixel CCD delivering images as large as 2,592 x 1,944 pixels. Fujinon 3x, 35-105mm (35mm equivalent) lens. Auto and Manual (EV and White Balance only), plus Portrait, Landscape, Sports and Night Scene modes. White Balance with six settings. Maximum aperture of f/2.8 to f/4.7, depending on lens zoom position. Shutter speeds from 1/2000 to two seconds, depending on exposure mode. Built-in flash with six modes. Auto ISO equivalent to 64 to 400. Contrast-type Auto focus using Multipoint TTL metering. xD-Picture Card storage (16MB card included). Power supplied by two AA-type batteries or optional AC adapter. Interface software and USB drivers included for Windows and Macintosh computers. DPOF (Digital Print Order Format) compatibility. Exif Print to record optimized print settings. Two- or 10-second Self-Timer for delayed shutter release. Lightweight, portable, and easy to use, the Fujifilm FinePix A350 digital camera offers the point-and-shoot convenience that novices enjoy, with the benefit of a 5.2-megapixel CCD and 3x optical zoom lens for good resolution and sharpness. Although exposure remains under automatic control, you can adjust Exposure Compensation and White Balance if needed, and the four scene modes are useful under common conditions. A simple, straightforward user interface means little or no downtime spent learning, and makes the Fuji A350 adept at shooting on the fly. For a "street" price just under $200, you get the color and clarity on which Fuji has built such a strong reputation, with the convenience of a very user-friendly camera design. Its simplicity and ease of use make this a good choice for a low-end "family" digital camera, or for any novice looking for a true "point & shoot" digital camera. Its attractive silver shell measures 3.5 x 2.4 x 1.2 inches (90 x 60 x 30.3 millimeters), not much larger than a credit card, if a good deal thicker. The low-profile controls make it easy to slip the Fujifilm FinePix A350 into your shirt pocket or small purse. Its compact size makes the included wrist strap a security measure more than an accessory. Loaded with an xD-Picture Card and two AA batteries, it weighs just 6.8 oz. (193 grams). The Fuji A350's front panel is dominated by the telescoping lens, which withdraws completely flush. The lens extends 7/8 inch when the camera is powered on in a Recording mode but remains retracted when powered on in Playback mode. A shutter-like lens cover automatically opens when the lens protrudes, eliminating the need for a lens cap. Also on the front panel are the flash, optical viewfinder window, microphone and the self-timer lamp. A thin, vertical finger grip is reinforced by a small thumb grip on the back panel. On the right side of the camera (as viewed from the rear) is the wrist strap mount. The opposite side of the camera houses the speaker, mini-B USB socket, DC In socket and the AV Out socket. All of the sockets are uncovered. The FinePix A350's top panel is flat with low-profile buttons for Power and the Shutter. The back panel is the business end of this camera. Along the top are the optical viewfinder, the three-position Mode switch (Playback, Movie and Still) and a rocker panel inherited from the A340 with click buttons on either side of the zoom rocker button. The left click button toggles Macro mode and the right button steps through the Flash modes. The 2.5-inch LCD monitor dominates the left corner, flanked by the Menu/OK button and the Display/Back button. The thumb grip and a slightly raised vertical ridge are tactile clues for gripping this small camera. On the bottom panel of the FinePix A350 are the plastic tripod mount and the battery/memory card compartment. The tripod mount is off center and adjacent to the compartment latch hinge, making it impossible to swap batteries when the camera is mounted to a tripod. An xD-Picture Card is easily clicked into place and ejected by simply pressing down slightly to release the hidden catch. Two AA batteries are likewise easy to load, with a clearly visible legend to remind you which end is up. With full automatic exposure control and only two manual adjustments available, the Fuji FinePix A350's user interface is very straightforward and quick to grasp. The Mode switch determines how the camera behaves when powered on. With the camera turned on, a single push of the Menu/OK button brings up the four-option menu, which is fairly limited and quick to navigate using the combination of arrow and zoom rocker buttons. In Manual shooting mode, two additional menus are available to set EV and White Balance, though you still don't have access to aperture or shutter speed. All camera controls other than basic Flash and Macro mode selections are accessed through the LCD menu system, so you should have no trouble shooting with the camera right out of the box. The Fuji A350's LCD monitor reports very basic information in Record mode, including the shooting mode, resolution setting, number of available images, and a central autofocus target. It also reports the flash mode, and settings for continuous shooting, Macro mode and the self-timer when activated. When necessary, warnings are displayed for battery level, auto focus and camera shake. Pressing the Display button enables an alignment grid, which divides the image area into thirds vertically and horizontally, for better framing of linear subjects. A third press disables the LCD monitor entirely. In Playback mode, the main LCD display shows the file number and capture date for a few seconds. Pressing the Display button pulls up the nine-image index display. Using the Zoom rocker button, you can enlarge captured images as much as 4.1x, depending on the quality mode (4.1x for 5M and 3:2, 3.2x for 3M, and 2.5x for 2M). Shutter Button: Located on the far right of the camera's top panel, this button sets focus and exposure when halfway pressed, and fires the shutter when fully pressed. Power Button: Just left of the Shutter button, this button turns the camera on and off. Menu/OK Button: Directly below the On / Play button, this button displays the settings menu in any camera mode, and acts as the "OK" to confirm menu selections. Disp/Back Button: Located on the bottom right of LCD monitor, this button controls the LCD monitor display, and activates the framing grid. It also disables the LCD monitor, so you can save battery power by framing images with the optical viewfinder. In Playback mode, this button also controls the information overlay, as well as enables a nine-image index display mode. Zoom Rocker Button: Tucked between two arrow keys in the upper right corner of the camera's rear panel, this two-way rocker button controls the optical and digital zoom. In any settings menu, this button navigates up and down through menu selections. In Playback mode, this button controls the Playback Zoom feature, which enlarges captured images as much as 13x. Right and Left Arrow Keys (see image above): Flanking the Zoom rocker button in the top right corner of the rear panel, these arrow keys navigate through captured images in Playback mode, as well as through menu selections in any settings menu. When an image has been enlarged, these keys also move around within the view. In Record mode, the left arrow accesses the Macro shooting mode, and the right arrow key cycles through the available flash modes. Quality: Sets the image resolution and quality to 5M Fine (2,592 x 1,944 pixels), 5M Normal (2,592 x 1,944 pixels), 3:2 (2,592 x 1,728 pixels), 3M (2,048 x 1,536 pixels), 2M (1,600 x 1,200 pixels), or 1M (640 x 480 pixels). Also shows approximately how many frames can be captured at each resolution with the installed card's remaining space. Self-Timer: Activates either the 2-second or 10-second Self-Timer, or disables the mode. Shooting Mode: Puts the camera into Auto, Manual, Portrait, Landscape, Sports, or Night modes. Continuous Shooting: Enables the camera to shoot continuously at 1.4 frames per second, or disables this feature. Exposure Compensation: (Manual mode only) Adjusts the overall exposure from -2.1 to +1.5 exposure equivalents (EV) in one-third-step increments. White Balance: (Manual mode only) Sets the white balance to Auto, Outdoors, Shade, Daylight Fluorescent, Warm White Fluorescent, Cool White Fluorescent, or Incandescent. Set-Up/LCD Brightness: Adjusts the LCD brightness, and offers a variety of setup menu options. Image Display: Turns the post-image capture review screen on or off. Power Save: Turns the power save option on or off. If on, you have the choice of a two- or five-minute delay before the camera automatically shuts off due to inactivity. Format: Formats the xD-Picture Card, erasing all files (even protected ones). Beep: Enables the camera's beep sounds, with options for Low, High, or Off. Date/Time: Sets the camera's internal clock and calendar. Time Difference: This option lets you set the time for another time zone. For example, when traveling, you can specify the time at home and for where you are, and the time difference is applied to captured images. LCD: Turns the LCD monitor on or off. If on, the LCD monitor automatically comes on whenever the camera is set to the Still Image Record position. If off, you must enable the display via the Display button. Frame Number: Sets the camera to number each successive image continuously from memory card to memory card, or to reset numbering with each new memory card. USB Mode: Sets the USB mode to DSC or PC Cam. PC Cam mode lets Windows users use the Fuji A340 as a webcam. Language: Sets the menu language to one of five languages. Video System: Assigns the video signal as PAL or NTSC. Reset: Resets all camera settings to their defaults. Erase: Deletes the current frame, or all frames on the memory card. DPOF: Marks/unmarks frames for printing on DPOF devices, with an option to include a date and time overlay. Protect: Write-protects the displayed image, preventing it from being accidentally erased or manipulated (except via card formatting). Also removes protection, and offers options to protect or unprotect all images on the card. Playback: Enables an automated slide show of all the captured images on the memory card, with options for transition styles. Trimming: Lets you crop an image and save it separately as a 3M, 2M or VGA file. Options: Displays the same settings as under the Record menu with a Volume option. Fujifilm FinePix A350 digital camera. Two single-use, AA-type alkaline batteries. Instruction manual and registration card. xD-Picture Card USB Drive (DPC-UD), a compact USB card reader. Two sets (four) NiMH rechargeable batteries and charger. See the specifications sheet here. We ran the FinePix A350 through our usual battery of tests, and have summarized our findings here. To see the full set of our test images, with explanations of what to look for in them, see the FinePix A350 Sample Pictures page. For a complete listing of all our test and "gallery" shots, go to the Thumbnails page. A collection of more random, pictorial images can be found in the Fujifilm FinePix A350 Photo Gallery. Not sure which camera to buy? Let your eyes be the ultimate judge! Visit our Comparometer(tm) to compare images from the FinePix A350 with those from other cameras you may be considering. The proof is in the pictures, so let your own eyes decide which you like best! A typical 3x optical zoom range, with good performance. The FinePix A350 zooms over the equivalent of a 35-105mm range, fairly typical for its class. Though a little soft at wide angle, with some noticeable coma distortion in the trees, the A350's lens still performs quite well. The 4.1x digital zoom takes it out to 12.2x total, albeit with the loss of quality that digital zoom creates. A small macro area with good detail and high resolution. Flash exposes fairly well, but flash illumination is uneven up close. This is the tendency for the lens to bend straight lines outward (like a barrel--usually at wide angle) or inward (like a pincushion--usually at telephoto). 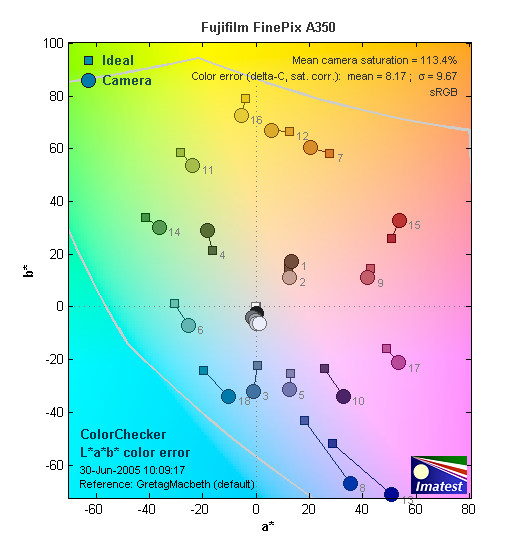 The Fujifilm FinePix A350's 0.6% barrel distortion at wide angle is lower than average among the cameras I've tested. At the telephoto end, the A350's 0.02% barrel distortion is very low indeed. Moderately high, small effect on images at edges. Some softening in the left and right corners of the frame, strongest effect in the lower right corner. Soft in the lower left corner. Slightly soft in top right corner. The FinePix A350 produced soft corners in a few shots, though the lower left corner seemed to have the most visible effect. Most consumer digital camears show this effect to one degree or another, the amount shown here is more than most, but doesn't extend very far into the frame. Moderate warm cast with both Auto and Incandescent white balance settings. Less exposure compensation required than usual. Color balance indoors under both Auto and Incandescent lighting was just a bit warm and reddish but on the whole fairly pleasing. The FinePix A350 required a +0.6 EV exposure compensation boost to get a good exposure. Overall color well-balanced and hue accurate, a bit less than most cameras need on this shot. Our test lighting for this shot is a mixture of 60 and 100 watt household incandescent bulb, a pretty yellow light source, but a very common one in typical home settings here in the US. Good color balance, very bright colors. Better than average exposure accuracy. Outdoor shots generally showed accurate exposure with slightly blown out highlights. Shadow detail also tended to fall apart, but nothing that would raise an alarm for a consumer digicam. Sunlit shots showed high contrast and oversaturation while overcast scenes managed a more accurate portrayal. Exposure accuracy overall was better than average, the camera requiring less exposure compensation than we're accustomed to seeing with consumer digicams. High resolution, 1,200 - 1,250 lines of strong detail. Our laboratory resolution chart revealed sharp, distinct line patterns down to between 1,200 and 1,250 lines per picture height, with extinction at around 1,600. (The camera did produce slight color artifacts at lower line frequencies though, visible in the full-sized res target shots.) Use these numbers to compare with other cameras of similar resolution, or use them to see just what higher resolution can mean in terms of potential detail. Beware that while you might be able to make out what looks like distinct lines at numbers higher than those we've mentioned here, the camera is just doing its best to continue interpreting the lines. If you zoom in and follow them from the wider portions, you'll see the lines converge and reappear several times, so the lines you see at 1,500 and higher are really only artifacts generated by the camera's imaging system. Fairly sharp images, with some blurring of detail from noise suppression. Noise suppression tends to blur detail in areas of subtle contrast, as in the darker parts of Marti's hair here. Moderate noise under normal lighting, increasing loss of subtle detail as ISO is boosted under low light conditions. The FinePix A350 automatically sets sensitivity between ISO 64 and 400 equivalents. Our test shots show only one setting for each setup because ISO is controlled by the camera, not the user. (The camera only went higher than ISO 100 under very dark conditions, and appears to only use the ISO 400 level for flash photos in very dark surroundings.) At ISO 100, the FinePix A350 produced moderate noise, with only slightly blurred detail in the dark areas. As the ISO setting increases, so does the noise level and the amount of blurring that results. Flash shots at ISO 400 were very noisy. High resolution with good overall detail, but high contrast and limited shadow detail. Pretty good low-light performance, capable of capturing bright images under average city street lighting and slightly darker conditions. Slightly oversaturated color (especially reds and blues), very typical of consumer digital cameras. Generally good hue accuracy. In the diagram above, the squares show the original color, and the circles show the color that the camera captured. More saturated colors are located towards the periphery of the graph. Hue changes as you travel around the center. Thus, hue-accurate, highly saturated colors appear as lines radiating from the center. The other important part of color rendition is hue accuracy. Hue is "what color" the color is. Here, the FinePix A350 did quite well. Like most digicams, it shifts cyan colors toward blue, to produce better-looking sky colors, but the rest of the hues were quite accurate. Optical viewfinder tight and skewed to the upper right. Very good accuracy from the LCD monitor. The A350's optical viewfinder was quite tight, showing only 77% of the final frame area at wide angle, and 81% at telephoto zoom settings. However, the LCD monitor showed almost exactly 100 percent frame accuracy regarless of zoom position. The A350's small flash has a limited range, and produces a slight blue cast in combination with typical incandescent room lighting. Our standard shots required more exposure compensation than average. Even at eight feet, our closest test range, the flash illuminated the DaveBox target adequately. This agrees with FinePix's own spec of 7.9 feet for flash range, a bit on the short side, although not uncommon for a compact camera model. A much more severe issue with the A350's flash is that the camera boosts its ISO to 400 for flash shots in very dark surroundings. (Our flash tests below are shot in total darkness.) This has the benefit of boosting flash range considerably (doubling it relative to performance at ISO 100), but at a terrible cost in image noise. Flash shot from the A350 captured in very dark surroundings really aren't usable for anything above 4x6 inch snapshot prints, and will look a little rough even at that modest size. Good print quality, great color, very usable 11x14 inch prints. ISO 400 images are very soft at 8x10, acceptable at 5x7, great at 4x6. With the FinePix A350, we found that it had enough resolution to make very crisp 8x10 inch prints. At 11x14, its prints were a bit softer looking, but more than adequate for wall or table display. At high ISO, image noise levels are held in check, but at the cost of rather soft-looking images. ISO 200 photos look OK printed at 8x10 inches, but ISO 400 ones are marginal even at 5x7 inches, but look fine at 4x6. Color-wise, the FinePix A350's images looked really great when printed on the i9900, with bright, vibrant color. Users who prefer more subdued, technically accurate color saturation levels may find the A350's images a little too bright, but most consumers will probably find the A350's bright, snappy images very appealing. Average to slow speed for a consumer camera. The A350's performance ranges from just average to slow, depending on what you're trying to do. Start up falls in the average range. Shutter response when the lens is set to its wide angle position is slightly slower than average. At the telephoto end of the lens' range, the lag time of 1.64 second is much slower than average. On the other hand, if you "prefocus" the camera by half-pressing and holding down the shutter button before the final exposure, it's much faster, with a shutter delay of 0.3 second, about average for inexpensive point & shoot digital cameras. Shot-to-shot cycle times are also on the slow side of average, at 3.57 seconds for large/fine JPEGs. There is no buffer memory, all shots are this speed, regardless of how many you've snapped in succession. Continuous-mode speed is average, at a bit over one frames/second, for up to five shots in succession. The flash takes about seven seconds to recharge after a full-power shot, about average for this class of camera. Connected to a computer, download speeds are fast enough (828 KB/second) that you probably won't feel a need for a separate card reader, but nonetheless aren't as fast as many cameras currently on the market. Bottom line, while not a first choice for sports or other fast-paced action, the A350 is responsive enough (particular at wide angle lens settings) to handle most family photo opportunities. See full Picky Details page. A 16-MB xD-Picture Card is included with the FinePix A350. Fujifilm's FinePix digital cameras have always been associated with good image quality and color, with solid performance even at the lower-end of the line. With a 5.2-megapixel CCD and 3x optical zoom lens, the FinePix A350 continues that tradition in an attractive new design, although image resolution isn't really on par with the best 5-megapixel models out there. Like the most recent A Series models, it offers four preset scene modes and a long maximum exposure time. Its color is very bright and highly saturated, likely to be appealing to many consumers, even though it's not technically "accurate" color. Overall, it's a decent entry-level digital camera, offering adequate resolution for 8x10 inch prints and an optical zoom lens at a very low price. A workmanlike entry-level model, particularly for daytime shooting, but a little limited after dark.